David is among just a handful of the school’s students who are homeless. He and his father share a tarp-covered RV in a parking lot at Dwight Murphy Field. His father, Lee Haralson, has raised him since he was 2. It’s uncommon to see homeless men raising children, but Mr. Haralson is an unorthodox man. “I used to walk around town with a stroller,” he said. If there is one lesson Mr. Haralson has tried to instill in his son, it’s that he needs an education. “I don’t want him living like this,” said Mr. Haralson, who chain-smokes and whose gnarled hands have at least two rings on every finger. He makes and sells them. Mr. Haralson, 56, is a native of Flint, Mich. He signed up for the Army instead of graduating from high school. He went to Vietnam. While there, he said, his platoon was ambushed in the jungle, and he took two bullets in the hip from machine gun fire. 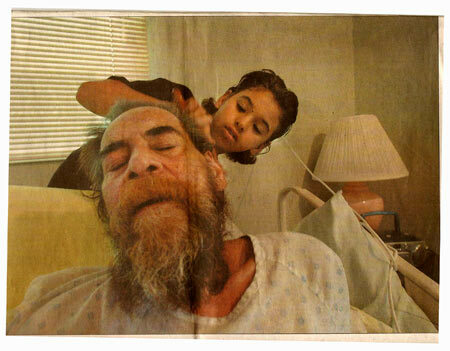 Although he was flown to a hospital and treated, he carried the bullets in his side for some 30 years. When David was a toddler, Mr. Haralson took him to South America. There, he said, he worked as a mercenary, training “people how to defend their property.” The pair spent several years living in lean-tos and bunkers in the jungles of Nicaragua. Eventually, Mr. Haralson decided to return to Santa Barbara, where David was born. Mr. Haralson mustered the cash for a run-down motor home. He enrolled David at Franklin Elementary, where he skipped kindergarten and went straight into first grade. Every day, the man walked or drove his son to school. He boasted that David only missed two days of school. “It was five,” David said. “Remember when you started getting those headaches?” David insisted on staying home with him. Mr. Haralson said he has a brain tumor, as well as cancer on his lung and heart. Last summer, Mr. Haralson, who blames Agent Orange for his ailments, said he learned he did not have long to live. He put his son on a plane to Michigan to live with his grandfather. Six months later, seeing he was still alive, Mr. Haralson decided to send for his son, who recently arrived. “I missed him,” he explained. 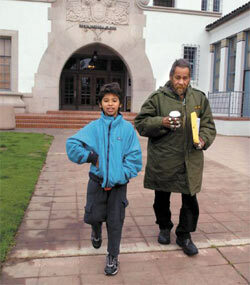 About a month ago, Mr. Haralson enrolled David at Santa Barbara Junior High. He started classes shortly thereafter. Now, Mr. Haralson said, he hopes he can hold out for at least five more years. “That’s when he turns 18,” he said. Later in the day, Mr. Rodriguez switched gears, morphing from private eye to surrogate parent. At a local hospice called the Serenity House, he visited a boy, David, and his homeless father, Lee Haralson, who is dying of a brain tumor and has less than three weeks to live, hospice workers say. David – who sleeps in a recliner by his father’s side – has a tendency to stay up all night playing video games at the hospice, and has been falling asleep in class. His father issued an inaudible moan and slowly lifted his arm. Just three months ago, Mr. Haralson was able-bodied and lucid when he recounted how he took a couple of bullets in Vietnam, had lived in South America until David was old enough for kindergarten, and walked David to Franklin Elementary every day. At the time, he wore at least two homemade rings on every finger. Last week his fingers were so thin the rings slid right off, but he insisted on wearing them. Mr. Rodriguez went outside the room and asked the director of the hospice to make sure David turned off the video games at 8 p.m. on school nights. As with the teenager, Mr. Rodriguez at one point found himself digging into his own pockets to keep David going to school – to the tune of $200. The story highlights not only the difficulty of getting homeless kids to school, but also the unpredictability and instability of the homeless population, and how the odds are stacked against their children. It was almost a year ago, shortly after Mr. Haralson was diagnosed with terminal cancer and preparing to die. His brother, Anthony – himself intermittently homeless – drove over from his home in Colorado with the idea of bringing David all the way back to Michigan, home of the brothers’ father, David’s grandfather. Mr. Rodriguez helped Franklin Elementary School send David’s file – birth certificate, immunization records and test scores – to enroll in a school in Michigan. But the drive to Michigan hit a snag, and Mr. Rodriguez ended up providing $200 toward David’s plane ticket to his grandfather’s home. Then, in an unexpected twist around September, Mr. Haralson – already weak from cancer – and a friend drove a broken-down Thunderbird all the way to Michigan to fetch his child. He missed David. This fall, Mr. Rodriguez was surprised to get a phone call from Mr. Haralson, asking how to enroll David into Santa Barbara Junior High School. Last week, Lee’s brother, Anthony, was back in town, working like mad to fill out the paperwork necessary to gain custody of his nephew, and trying to figure out what to do with the RV in which his brother and nephew had lived. It’s been a race against time: If Anthony doesn’t get the paperwork done before his brother dies, his nephew will become a ward of the state. It’s a fate that even Mr. Rodriguez fears, because he believes David would bolt from a foster home. He also believes Anthony will be a loving parent – the man is already the grandfather of two healthy children.